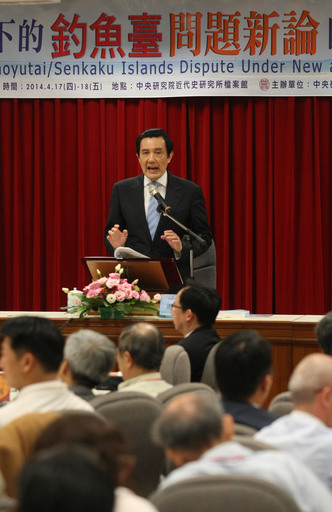 Taipei, April 17 (CNA) Japan only has the right to administer the disputed Diaoyutai Islands, Taiwan's President Ma Ying-jeou said Thursday, stressing his government's stance that the uninhabited islets belong to the Republic of China. The United States handed administration of the islets -- called Senkaku in Japanese -- to Japan in 1972, Ma noted at a seminar on the islands at research institute Academia Sinica. "What Japan enjoys so far, we believe, are only (those) administrative rights," he said at the seminar, held to mark the 119th anniversary of the Treaty of Shimonoseki, the agreement that handed Taiwan and surrounding islands to Japan following the close of the First Sino-Japanese War. Japan has retained control over the Diaoyutais, believed to be surrounded by rich ocean resources, but continued disputes over the area and historic grievances have left many worried about the possibility of armed conflict in the tense region, Ma said. "We have a very good understanding of the context surrounding the Diaoyutai Islands," he said, "and the way the situation is developing could be very dangerous indeed." As it is located in a pivotal location in East Asia, Taiwan has the responsibility to help reduce tensions, he said, something his administration aims to do through diplomacy. The Diaoyutais lie some 100 nautical miles northeast of Taiwan and have been under Japanese control since 1972. In addition to Taiwan's claim, China claims them as the Diaoyu Islands. While the president's focus Thursday was on internationally disputed islands, protesters outside tried to shift the focus to an internal dispute, calling for Ma to "listen to the people" and their concerns over the trade-in-services pact with China as he arrived at the building. Ma, surrounded by bodyguards, entered the venue without commenting. During his speech, two silent protesters in the audience held placards demanding the passing of a law to monitor the signing of cross-strait agreements before the service pact is reviewed, but the seminar proceeded without being affected.